It was the mid-1980s. I was growing up in a small town in the suburbs of Boston. I was a teenage car nut, but too young to drive, so I bicycled everywhere instead. A local Porsche dealer was holding a car show on the lawn of a museum across town. I really liked my Matchbox 911 Turbo, so on the basis of that toy I decided to bike over there and check out some real ones. I didn't really know what I was looking at. My memory may not be reliable mumble mumble years later, but I don't even recall seeing any 944s, 924s, or even 356s – it was all 911, all the time. And there were all sorts of 911s. I liked the looks of them, but I didn't know anything about the individual models. I couldn't tell a Turbo from a 911SC from a Carrera RS. I do remember seeing a slant nose, because I'd recently built a model kit of one. But there was one car, unlike all the others, that really stuck out at me. It was clearly a 911. And it was clearly a race car, with all the stickers and numbers and the roll cage and such. But this wasn't some lowered, lean, mean track machine. It was jacked up several inches above all the other 911s there. Between the headlights, four additional lights had been mounted in a pod unit. It had much larger wheels, and the tires were thick and chunky. Their similarity to my mountain bike's tires told me that these were meant for use off pavement, rather than on. I thought to myself, "What idiot would take a Porsche 911 on dirt?" What can I say? I was young and foolish. I knew nothing of rally. I was missing out on the glory days of Group B as it was happening. We didn't have cable channels dedicated to racing coverage. (Wait a minute – we still don't.) We didn't have YouTube videos showing simple European hatchbacks with huge engines stuffed into the back and all wheel drive systems screaming down gravel roads and flying through the air over jumps. Racing, as I knew it, consisted of NASCAR, Indy Car, and Formula 1, because that's what I occasionally had the chance to see on TV. Later on, reading books about cars and racing, I would sometimes see a picture of this car, or one like it, doing what it was made to do at a rally. I didn't know much, but I did know that in order to be flying through the air that high, or causing that huge of a water splash, that car must've been moving pretty fast. Eventually, once the worldwide web came along, I started reading more about rally on the NASIOC forum (then known as i-Club). Someone on the forum was selling, er, "backup copies" of the year's World Rally Championship coverage, so I bought a set. When I watched them, I discovered the coolest form of racing I'd ever seen. No tracks. Real roads. And, though obviously highly modified, they were real production based cars. 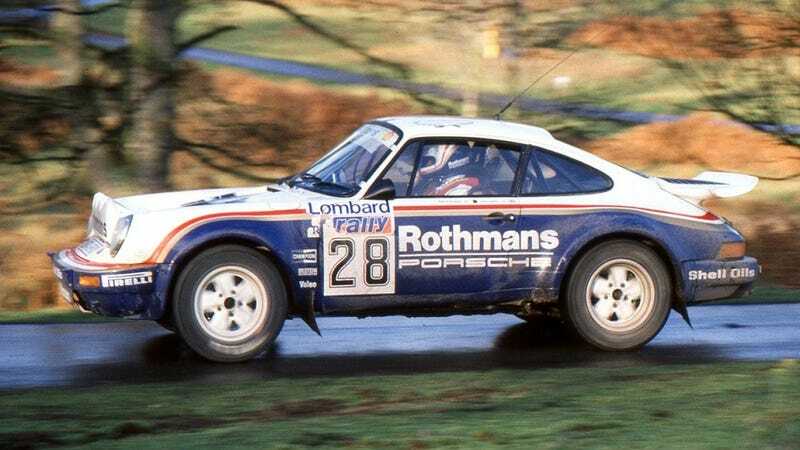 And once YouTube became a thing, I could go back in time and finally see the Rothmans 911 in action. Since then, I've volunteered at rallies many times, especially since finding out how useful my amateur radio license (which I've also had since the 1980s) is at rallies. I've been a stage marshal. I've helped run timing controls on occasion. I've co-driven sweep vehicles many times, and that experience landed me a gig in car 0, the course opening car, a few years back. More recently I've started driving course cars as well, with my rally enthusiast girlfriend as my co-driver. In fact, pretty much the only role I haven't held at a rally yet is being a competitor, and we hope to do that someday as well. Though I didn't know what it was at the time, I now look back on that day at the Porsche show, seeing a famous Group B World Rally Championship car, and appreciate the opportunity to have seen a piece of rally history.